nice -20 assigns a low priority to your process, so that you can do other things while modeling proceeds. It must be made executable. 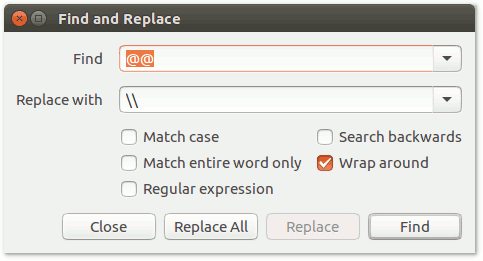 I use gedit in LINUX/GNOME as my text editor: "gedit myimage.sh &". nice -20 is not really part of it: it is used to set a very low priority level. nice -0 would be an average level. The command line is a long and complex character string which starts with the name of the executable code like ./4SM.7.11. This string is composed of many arguments. With the exception of the executable code name (e.g. 4SM) in the first argument, each following argument starts with a "-" character. Each argument is a complex string of characters which is decoded at the start of the execution. To disable an argument, start it with a " @ " character. @-Lsw66.00/17.00/11.00/006.0 this argument is disabled. To enable it again, remove the "@" character. -Lsw66.00/17.00/11.00/006.0 this argument is enabled. -deglint...ensures that the glint parameters are available and shall be enforced. -extract...ensures that the extraction parameters are available. 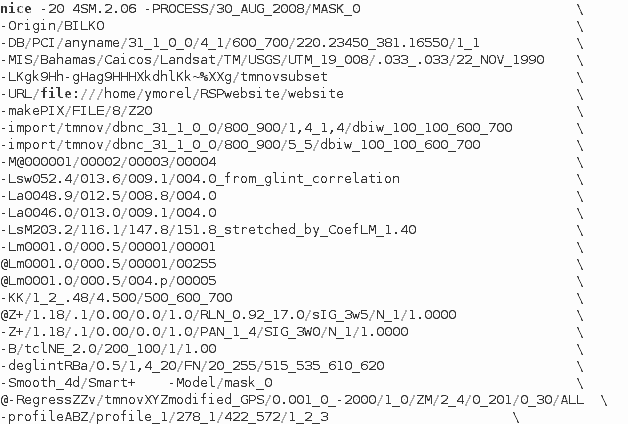 -model...ensures that the mask specification is available. The following sequence -Lsw66.00/17.00/11.00/006.0 -Lsw67.00/16.00/11.00/006.0 will retain the second -Lsw67.00/16.00/11.00/006.0. The only exception is the -CP argument: the following sequence -CP105.00/30.00/15.00/06.00 -CP082.00/21.00/12.00/06.00 (...) describes a sequence of two (or more) distinct calibration pixels. To enable it again, remove the # . Alternately, one can place an " exit " instruction as appropriate. Those commandlines which are enabled are executed in sequence, until an "exit" instruction is eventually encountered.